Ever since discovering Violation I’ve been in a major mood for Starz. The band blended a variety of styles together so effortlessly: glam rock, power pop, rock ‘n’ roll and heavy metal. Attention Shoppers! dives completely into power pop and turns away from drafting up too many heavy numbers that might have been at home on Violation. “X-Ray Spex” and “Good Ale We Seek” seem to get a lot of praise as being the two best rock songs on the album, but I personally feel “X-Ray Spex” is kinda weak. “Good Ale We Seek” is a good, but odd sounding song. It’s a bit trippy, but I like it. The lyrics are really fun. “Johnny All Alone” is a mid-tempo track that reminds me a bit of Ted Nugent when it comes to the guitars. Even the bonus tracks are really good. I’m not sure when they were recorded, if they were B-sides or whatever, but they’re good. “Texas” is a fun boogie rocker and “Wind” comes across as southern rock to me. See? This band did it all and they did it well! Maybe this album would’ve been better reviewed and a tad more successful if these songs were on the album. This album is another strong release from the band. I sound like a broken record but it’s absolutely criminal these guys didn’t find a wider fan base with these albums. Guitarist Richie Ranno didn’t like this more commercial direction and hated the album for years. Only recently has he changed his mind and admitted the album is pretty good. What I find interesting is that according to the band history in the CD booklet (all the Rykodisc reissues talk about the events surrounding each album), Ranno was at war with bassist Peter Sweval and the band’s other guitarist Brendan Harkin over the direction of the band. They wanted a poppy sound, Ranno wanted hard rock. For some odd reason, Michael Lee Smith & Joe Dube stayed out the argument. I guess they were content to do whatever they were told to do. Outnumbered, Ranno lost the argument and we got this album. Also, producer Jack Douglas (who produced the band’s first two releases) wasn’t available at the time but Capitol Records was demanding new material so the album was self-produced. If Douglas was leading the way, I think we would have had a very different album. The end result of all of that is a very commercial album that is just as good as their harder material. It’s just too bad that the commercial sound turned off the small fan base they had. 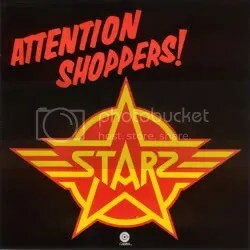 Starz was one of those bands that should’ve gone on to become a huge commercial success. They had it all: a talented singer, two great guitarists, KISS’ manager (Bill Aucoin), Aerosmith’s producer (Jack Douglas) and a great live show. So why didn’t it work? I don’t know, maybe Capitol Records dropped the ball, but you can’t lay the blame on the band. They toured relentlessly and cranked out four quality albums over four years before calling it a day (a number of live albums have been released over the years too). The band’s debut, unsurprisingly, sounds a lot like KISS and Aerosmith though the band’s own brand of early pop metal (which would serve as inspiration for bands like Poison, Motley Crue and Bon Jovi in the ’80s) is evident as well. The album starts off with “Detroit Girls”, a not-so-subtle nod to KISS (Gee, is Ace playing guitar on this one? ), and the Aerosmith-influenced “Live Wire”. The band’s own sound comes through on songs like “Night Crawler”, “Over and Over” and “Now I Can” while “Boys in Action” is such a hair metal song, I’m surprised no one ever covered it in the following decade. Definitely a good debut and a lost hard rock treasure but I think the rest of their albums are better. Can someone tell me why Starz didn’t blow up huge??? Just on this album alone these guys should be viewed as rock ‘n’ roll legends! This is my first Starz release, I’ve had a number of their albums on my wish list for years but always hesitated to buy them. Well, I finally decided it was time for some new blood in collection and ordered Violation based on many reviews I’ve read saying this is their best release. Well, if this isn’t their best, I really need to hear what’s better! Starz are often compared to KISS & Sweet and are noted as influences on the ’80s glam-metal scene and it’s easy to understand why. 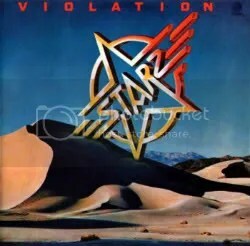 Violation combines pop and hard rock to near perfection and the KISS comparison is evident on a song like “Violation” (where if I didn’t know better, I’d swear that was Gene Simmons yelling in the background) and even the guitars at that times sound inspired by Ace Frehley. The album’s opener “Cherry Baby” I’ve seen cited as the seminal Starz tune, but personally, while it is good it is a bit too poppy and glammy for me. Killer hard rockers like “Rock Six Times” and “Subway Terror” are the two finest songs on the album, in my opinion. The whole album is carried by the charismatic and smooth vocals of Michael Lee Smith. I really love his performance on “Cool One”, in which the whole tune carries a ’50s rock ‘n’ roll vibe. And I’m not sure who was the main writer in the band but I love these lyrics! This is where the ’80s glam-metal influence this band had is apparent. Such naughty lyrics but they are humorous and witty at times (“Cool One”, “Rock Six Times”) but also downright creepy as well like on “Subway Terror” where the song is told from the point of view of a subway killer! 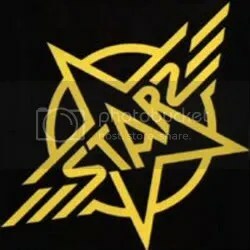 Consider me a Starz fan now and I hope to be adding more of their albums to my collection soon.